After all that talk about omega 3’s, I thought it was only right to give you a recipe to follow suit! 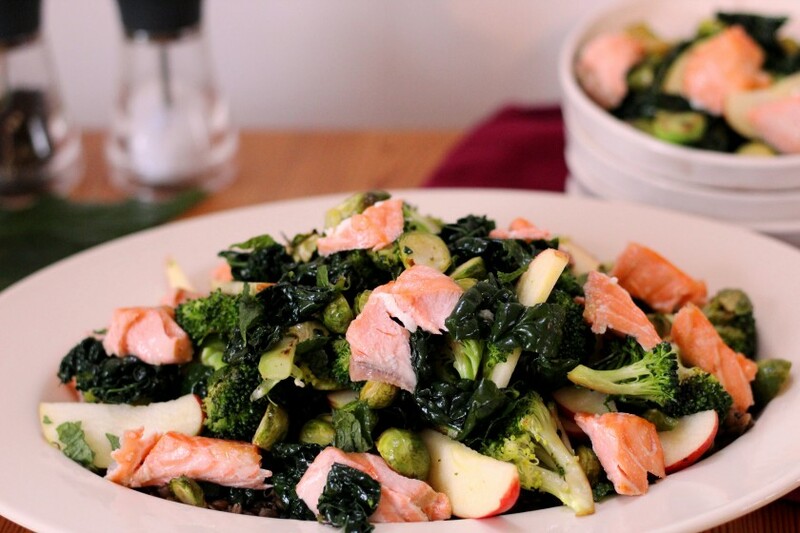 This salmon melange is really a celebration of the late autumn bounty of brassicas, apples and kale, with some bay infused lentils and fresh mint. It’s very satisfying and is ideally eaten warm but can also be taken as an on-the-go lunch. If you read my previous post about omega 3’s, you’ll remember how important they are for pregnancy. Unless you’re vegetarian, it’s recommended that you have around 2 portions of oily fish per week. Not only does this help your baby’s development but also helps reduce the risk of complications such as pre-term labour and pre-eclampsia. Salmon, especially wild alaskan, is high in omega 3’s and lower on the mercury scale. Plus, it’s easy to find in most, if not all supermarkets! The brassicas family, also known as cruciferous vegetables, are those vegetables such as broccoli, brussel sprouts, cabbage, kale, and spring greens that are nutritional powerhouses and very high in folate. You might remember your midwife talking about folate (or folic acid) and it’s importance during early pregnancy to help prevent neural tube defects. But brassicas are also great for those at risk or already suffering from gestational diabetes as they are high in fibre, and help regulate blood sugar levels. Brassicas, like most vegetables, also contain a fair amount of vitamin C, which combined with iron-rich lentils, help the iron to be absorbed to reduce the risk of pregnancy anaemia! I am aware though that a lot of you may be turning your noses away at the thought of eating those dreaded sprouts! I challenge you to give them a second chance. I agree that brussel sprouts- when overcooked- are gross. Sure. But, you might be surprised to find out that they can be delicious when prepared and cooked properly. The secret is, never boil those sprouts- roast them! Turn your oven on to 175 C (or 350 F). Rinse the lentils and place in a pot of water together with the bay leaf and turn the heat up. Allow them to simmer for about 20-25min or until soft but not mushy. While the oven is heating up, prepare your brussel sprouts. Wash and remove the tough outer leaves, and cut them in half. Place them in an oven proof dish with a little coconut oil and salt. Separately, place your salmon filets in an oven proof dish and add a teaspoon of coconut oil on top. When the oven is hot place both the sprouts and salmon in the oven for 20 minutes (unless you buy the baby sprouts in which case it would be about 15min). In the mean time, wash and cut the broccoli into small florets, and place in a pan with a little coconut oil and about 2 tablespoons of water. Turn up the heat and allow the water to evaporate and the broccoli to brown a little. Make sure you keep an eye on the broccoli and turn regularly to ensure the florets don’t completely burn. Turn off the heat when the broccoli is still al dente. While that’s all cooking, slice the apple and chop the mint and place in a large bowl. To make the dressing, add the mustard, vinegar and honey first, and mix together, before adding the olive oil, salt and pepper. Once the lentils are cooked, drain and add to the bowl together with the apple, mint, broccoli, and brussel sprouts. Mix in the dressing and plate up. Finally, flake the salmon and add to the melange; and you’re all set!